A visit to MotoWorld this evening proved more financially damaging than I was prepared for. Was initially there to look at some gloves. I didn’t have a decent pair. My present gloves were low quality MIC wannabe’s that I purchased for my 2B learning. Cheap, but not very comfortable. That’s why I went back to the durian seller gloves during my TP test in January this year. They offered little protection, but were quite honestly, the most comfortable pair of gloves I had – not to mention that they were the cheapest too. So coming back to present day, I’ve had my 200ns for about 3 months now. Re-visited the cheapo gloves I had previously purchased and still I could never get used to them. They felt too stiff and were really restrictive. So I went with some cheap leather (considering the price I paid for it, I’m not even sure if they were genuine leather) half-finger gloves. These were a lot more comfortable, but obviously offered less protection. But as of late I had travelled to KL and back twice, I realized that these half-fingered gloves had 2 main issues. Firstly, like I mentioned, they offered little protection. Thankfully I didn’t have to find out how it will hold up during a tarmac slide, but even the humble raindrops were merciless to the exposed fingers at highway speeds. Not good. Next, because my fingers were exposed, my finger tips – especially under the nails – looked like I’ve dug through 6 foot of soil after an even short run on the bike. Yucks. And definitely not useful if I wanted to catch some light (and quite literally) finger food after a ride. Sure, I can wash them. But they still remain yucky until after a while. Not nice. And of course, being a no-brand pair of gloves, I’m really not sure how the stitches will hold up during a fall. Not confident. I had some time this evening and so I popped by MotoWorld at Kaki Bukit. Wow-wee! Looking at the gloves on display, I could immediately tell the quality difference of an original RS Taichi or Komine vs a no-brand or an MIC knock-off. So I went trying multiple pairs of gloves, and…..
…It was love at first sight!! You know that feeling that THIS IS THE ONE? Yes, I picked up a pair of RS Taichi RST427 leather and mesh gloves and it immediately melted my heart. No, it wasn’t the looks (I’m not that shallow, okay! ), but it was how it felt! This was the most comfortable pair of riding gloves I’ve tried!! Even more comfortable than my half-glove. Such a stark difference from my existing pairs. So, out of curiosity, I went trying on riding jackets. And oh, oh. I think you probably know where this would go. So Fazli bro, IF YOU HADN’T ASKED FOR THE WRONG SIZE, I WOULDN’T TRIED THAT JACKET AND WOULDN’T HAVE SPENT THAT MONEY!!! Hahah…. Just kidding… But what a small world to meet him twice in a day! Once at MotoWorld, and the other here on Facebook. 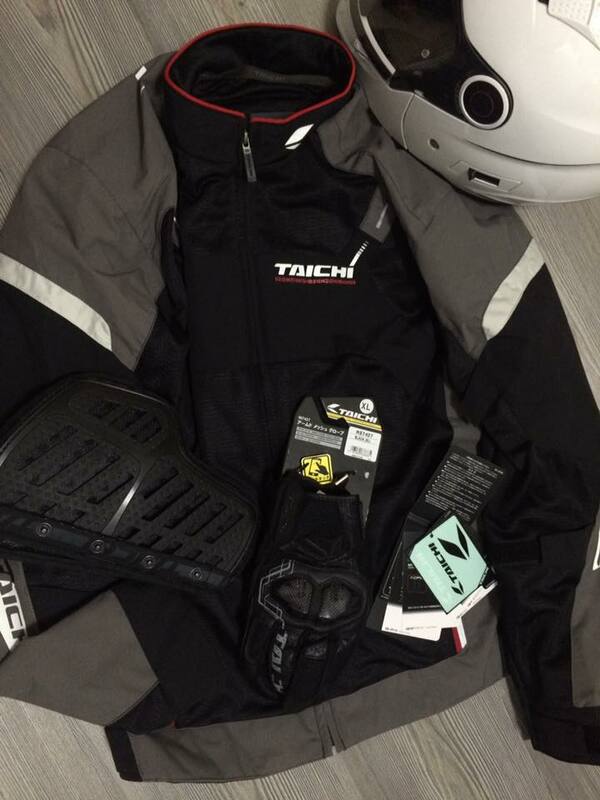 And eventually, I ended up buying the pair of gloves ($100), the mesh riding jacket ($210) and a complementing chest protector ($45), and spent over $300 today. Luckily Safra members were given a 10% discount. So that saved me some $$$. That’s enough retail therapy for today.